If you've arrived at this page because your alarm system is showing trouble due to a low battery, you have two options - you can call in a service technician or you can replace it yourself. We recommend the latter only if you're at least somewhat comfortable with a DIY project and working with wires. Security systems are powered by AC mains power, but they also have a battery backup that is automatically triggered when power fails, giving anywhere from an hour to several hours of protection until AC power is restored. Alarm batteries have a finite life span that could last for a year or a few years depending on how often and how long power has failed, the quality of the alarm charging circuit and the battery itself. If apower failure that lasts longer than the battery can cover, the battery can be damaged and may need replacing. Most security systems will show a trouble condition if the battery is failing. Step 1 - Find The Battery! Generally speaking, there are two styles of alarm systems. The style we will deal with in this article has a keypad likely by the entrance door, and a metal enclosure typically near the electrical panel or wiring closet. You're looking for something like the image shown here. The metal box will be closed, either with a lock or maybe a screw. If it's a lock... you'll need the key. If it's a screw you can simply remove the screw and the door should swing open. In our picture, the door has been removed for easy viewing. Note: If your security alarm system is monitored you should contact the monitoring company to let them know you're going to open the panel just in case they get a notification that the door has been opened. They may refer to this as putting the system 'on test'. Also you should let them know before you power down the panel in the next steps. Once you have the door opened you should see a rectangular battery sitting inside the metal box. You should see a model number and/or specifications for the battery printed on it. Security alarm batteries are 12VDC and typically from 4AH to 8AH in capacity. So you're looking for something like 12V 4AH, 12V 5AH, 12V 7AH, 12V 8AH or similar. If you can only find a model number you may be able to 'Google It' or often the model gives a clue eg. BD412 is a 12V 4AH battery. ELK-1250 is a 12V 5AH battery, BD712 and N712 are 12V 7AH batteries, and so on. The most common size battery is 4AH. 4AH, 4.5AH and 5AH batteries are typically the same size, around 4" x 3.5" x 2.57" (HxLxD) while 7AH and 8AH batteries are typically around 3.75" x 5.95" x 2.5" (HxWxD). You should see two terminals on the battery, one for negative (-) and one for positive (+). Positive is often marked red. Alarm batteries normally have what's called an F1 Faston tab or F1 187 terminal. 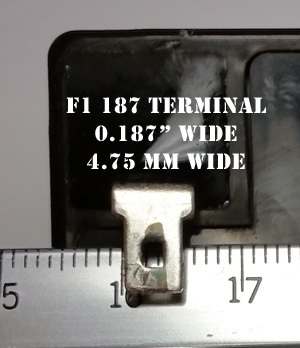 These are 0.187 inches or 4.75mm wide. You can easily measure to make sure the size is a match. Based on your findings, look for a replacement battery that matches your specifications. Generally speaking, if you have a 4AH battery now, you can use a 4AH or 5AH battery as a replacement. 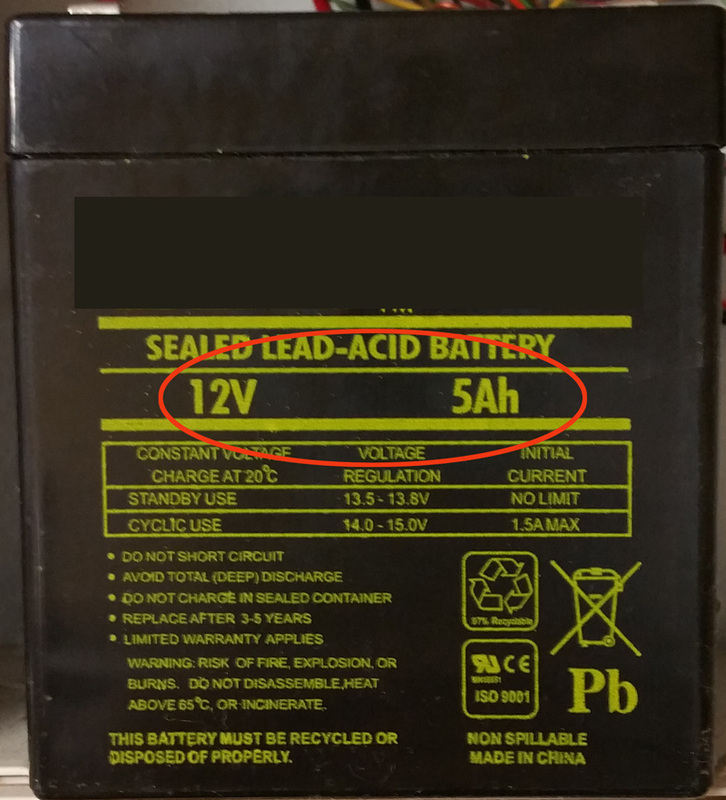 Likewise if you have a 7AH battery you can replace it with a 7AH or 8AH battery. In fact most systems can support up to at least 8AH batteries so you can normally upgrade to a larger battery HOWEVER you need to make sure it will physically fit in the enclosure so for that reason you may want to stick to the same size. Visit our Alarm Battery page to purchase your new battery. Reminder: If your security system is monitored, it's a good idea to call the monitoring company to let them know you're changing the battery. Next you will remove the two wires from the battery terminals - they should just pull off. You might need to wiggle them a bit to get started. 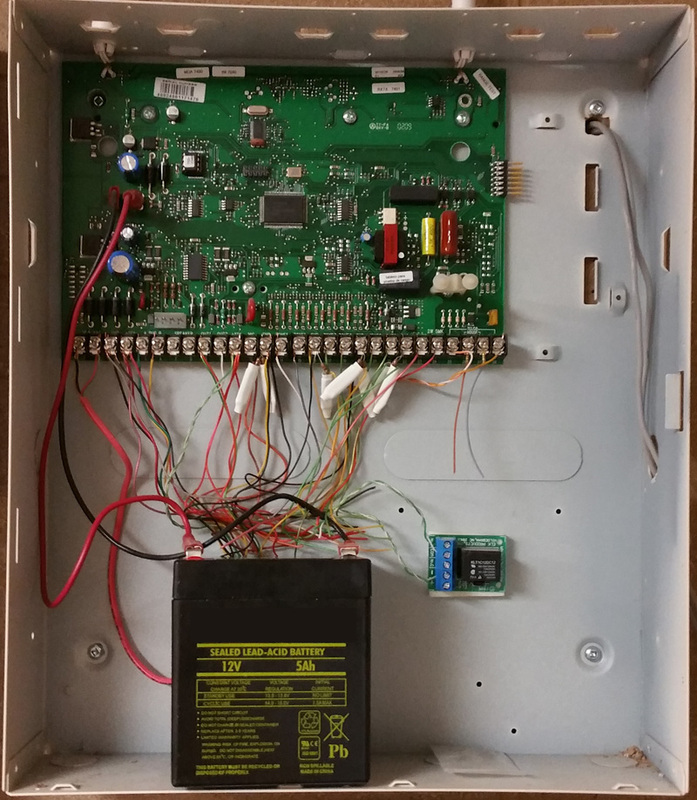 Remove the battery from the security system enclosure and put the new one in. Reconnect the alarm battery wires to the new battery, paying careful attention that the red (+) wire connects to the red (+) terminal of the battery. You may still see a trouble condition on the security system while the new battery gets charged. It can take 24-48 hours to fully charge the new battery so don't panic, but if it doesn't go away after 48 hours, try to arm and disarm the system or you may need to contact us for instructions on how to reset the trouble condition. That's it! By doing it yourself you'll save the cost of a technician's labour and driving time.